If you have yet to create an estate plan, there is no time like the present to get started on one. A well thought out and comprehensive estate plan can accomplish a wide range of important goals, including creating a framework for the distribution of your estate assets upon your death, protecting you and your family in the event of your incapacity, and ensuring that your loved ones are provided for when you are no longer here. 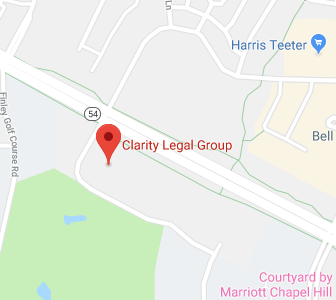 At Clarity Legal Group we understand and respect the important role your estate plan plays in your life and we are committed to helping our friends and neighbors in Cary, North Carolina with the creation of their individualized estate plans. Located in central North Carolina, the Town of Cary is the second most populous incorporated town in the United States with an estimated population of 162,025 as of 2018. Cary has seen almost a 50 percent increase in population since the year 2000, continuously placing the town among the fastest growing municipalities in the nation in recent years. The Town of Cary’s history goes back to the 1750s when the area was a settled known as “Bradford’s Ordinary.” As was often the case, it wasn’t until the railroad came through the area a century later and linked it to a major transportation route that the settlement really began to flourish. In 1854, Allison Francis “Frank” Page and his wife Catherine purchased 300 acres around the railroad junction, naming the development Cary after Samuel Fenton Cary, a Congressman and temperance movement leader of the time. In 1871, Cary was incorporated with Page acting as the town’s first mayor. Throughout the first half of the 20th century, Cary continued to grow and thrive. It was the second half of that century, however, that saw Cary blossom into the vibrant town it is today. Between the opening of Research Triangle Park in 1959 and the rapid growth of the City of Raleigh, both of which are within a short drive, the Town of Cary saw dramatic growth by the turn of the 21st century. In fact, Money Magazine named Cary, the hottest town in the East and one of six Hottest Towns in America. Cary was also recognized by Money Magazine as one of the Best Small Cities in America and was ranked fifth the magazine’s annual lists of Best Places to Live. Part of Cary’s attraction is the unusually diverse population coupled with the very real sense of safety residents enjoy. Almost one in five (19%) of the town’s residents were born in another country, leading to a diversity rarely found in a town the size of Cary. Residents also sleep easier at night knowing that Cary was ranked the third-safest among municipalities with populations of 100,000 to 499,999. Residents and visitors to Cary will find a town that embraces the future while honoring the past. Nearby Research Triangle Park is world renowned for cutting edge development; yet, not far away in Cary you will find the Page-Walker Hotel, the Carpenter Historic District, and Cary Historic District along with the Green Level Historic District, Ivey-Ellington House, and Nancy Jones House which are all listed on the National Register of Historic Places. At Clarity Legal Group we firmly believe that estate planning is vitally important for everyone. Moreover, estate planning is best accomplished when you have a comfortable, trusting and ongoing relationship with your attorney. For this reason, we strive to create a lifelong partnership with our Cary, North Carolina clients. Our belief is that through that partnership we can help you create an estate plan that protects you, your assets, and your loved ones both now and in the future. Creating your estate plan should be one of the most important endeavors of your lifetime. Once your estate plan is in place, it should do must more than simply dictate how your assets are to be distributed when you are gone. While planning for the distribution of your assets is part of a comprehensive estate plan, a well thought out plan should also help protect and grow those assets while you are here as well as ensure that they are available to provide for loved ones in the event of your incapacity or death. For your plan to achieve everything it can achieve, you will need to review and revise your plan on a routine basis as well as when certain events call for a more immediate revision. If you marry or become a parent, for example, you will likely want to make changes to your initial estate plan to include your spouse or child. Your growing family may also prompt you to incorporate incapacity planning into your estate plan and/or a trust to protect your minor child’s inheritance. Through hard work and wise investments the value of your estate will likely grow over the years as well. Your growing estate will undoubtedly cause you to consider adding asset protection and tax avoidance strategies to your plan. As you contemplate retirement, you may want to consider adding a Medicaid planning component to your estate plan as well as executing an advance directive to ensure that your wishes regarding end of life medical treatment are honored when the time comes. Finally, as a senior you may find that you have specific elder law issues that require the advice and guidance of an experienced elder law attorney. At that point, the close bond you have formed with your estate planning/elder law attorney will undeniably be beneficial to you and to your loved ones who are caring for you. The estate planning attorneys at Clarity Legal Group would be honored to help you create an estate plan that protects everything that matters to you, both now and in the future. If you have questions or concerns regarding your estate plan, or wish to make an appointment to get started on an estate plan, contact the experienced Cary, North Carolina estate planning attorneys at Clarity Legal Group today by calling 919-484-0012 to schedule your appointment.